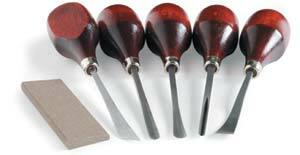 This set of carvers has a very fine quality, forged, heat-treated steel blades set in smoothly finished 4¾" (12 cm) palm-grip wooden handles. They're popular for relief carving on wood or linoleum. The 6-piece set includes a knife, chisel, gouge, shallow U gouge, veiner, and sharpening stone.